President Trump brought his "America First" doctrine to Vietnam. 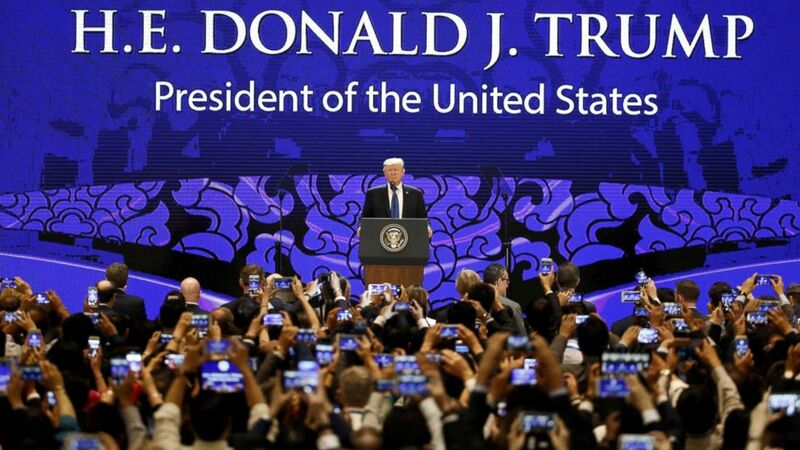 At the close of his speech to the Asia-Pacific Economic Cooperation Summit (APEC), President Donald Trump took a philosophical turn, echoing the words of Dorothy in "The Wizard of Oz" as he outlined his vision for a world order rooted in nationalism. Then, here at a forum of 21 Asian-Pacific nations designed to pursue common economic interests, Trump called for each country to take responsibility for pursuing its own self-interest. (Nyein Chan Naing/Reuters) President Donald Trump speaks on the final day of the APEC CEO Summit ahead of the Asia-Pacific Economic Cooperation (APEC) leaders summit in Danang, Vietnam, Nov. 10, 2017. It was a little odd to hear the president borrow a line from "The Wizard of Oz," but what he was really doing was articulating his Trump Doctrine. A doctrine that boils down to this: nationalism for America and nationalism for the rest of the world, too. His message to the Pacific nations: The United States will pursue its own self-interest without apology, but it won’t try to impose its will or its values on other nations. It’s the philosophy that made Trump a booster of Brexit over Europe and led him to withdraw from both the Paris Climate Accord and the Trans-Pacific Partnership trade agreement. Above all, it means the elevation of national interest over multi-lateral organizations, such as the United Nations and, even, the very organization he was addressing Friday in Vietnam. The speech today marked the president’s toughest words on trade during his Asia trip –- vowing a much tougher approach to trade guided by the Trump Doctrine for nationalism for everyone. Declaring that America has long been taken advantage of by its trading partners, the president put the blame squarely on previous administrations, Democratic and Republican, whom he portrayed as patsies on trade. He had also said “I don’t blame China” while he was in Beijing. But here in Vietnam, the president went on at length about U.S. concerns regarding China’s unfair trade practices. He didn’t mention China as he went through this litany of unfair trade practices -– a litany that also included cyber-attacks and corporate espionage –- but there was little doubt what country he was referring to. Tough words, but words said here in Vietnam and not in China. When he was in China, standing next to the leader of the country accused of doing all of those things, Trump largely avoided talking about them. In China, the president, for the most part, pulled his punches.